PARIS – Notre Dame Cathedral, the symbol of the beauty and history of Paris, was scarred by an extensive fire Monday evening that caused its delicate spire to collapse, bruised the Parisian skies with smoke and further disheartened a city already back on its heels after weeks of violent protests. 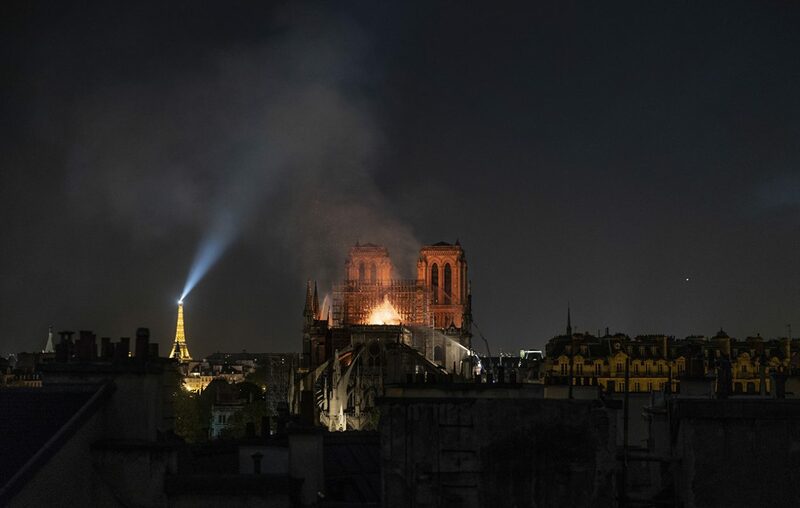 The spectacle of flames leaping from the cathedral’s wooden roof – its spire glowing red then turning into a virtual cinder – stunned thousands of onlookers who gathered along the banks of the Seine and packed into the plaza of the nearby Hotel de Ville, gasping and covering their mouths in horror and wiping away tears. The fire broke out about 6:30 p.m., upending Macron’s plans to deliver an important policy speech about trying to heal the country from months of demonstrations by the yellow vest protest movement that had already defaced major landmarks in the capital and disfigured some of its wealthiest streets. A jewel of medieval Gothic architecture built in the 12th and 13th centuries, Notre Dame is a landmark not only for Paris, where it squats firmly yet gracefully at its very center, but for all the world. The cathedral is visited by about 30,000 people a day and around 13 million people a year. For centuries France’s kings and queens were married and buried there. Napoleon was crowned emperor in Notre-Dame in 1804, and the joyous thanksgiving ceremony after the Liberation of Paris in 1944 took place there, led by Charles de Gaulle. World leaders congregated at the cathedral in a memorial service for de Gaulle in 1970, and then again for President Francois Mitterrand in 1996. On Monday evening, as the last rush of tourists were trying to get in for the day, the doors of Notre Dame were abruptly shut without explanation, witnesses said. Within moments, tiny bits of white smoke started rising from the spire – which, at 295 feet, was the highest part of the cathedral. Chauvet said firefighters were able to save some of the cathedral’s artworks but did not say how much was damaged inside the building. A linen fabric associated with Saint Louis, the Holy Crown of thorns and the cathedral’s treasury were saved. The cathedral had been in dire need of a thorough and expensive restoration, Andre Finot, the cathedral spokesman, told The New York Times in 2017. 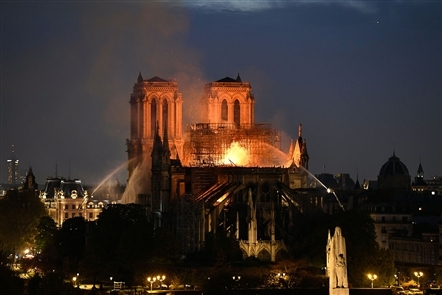 In recent years, the Friends of Notre-Dame, a foundation based in the United States, estimated that the structure needed nearly $40 million for urgent repairs. The French state, which owns the cathedral, already devotes up to 2 million euros (about $2.4 million) a year in upkeep.